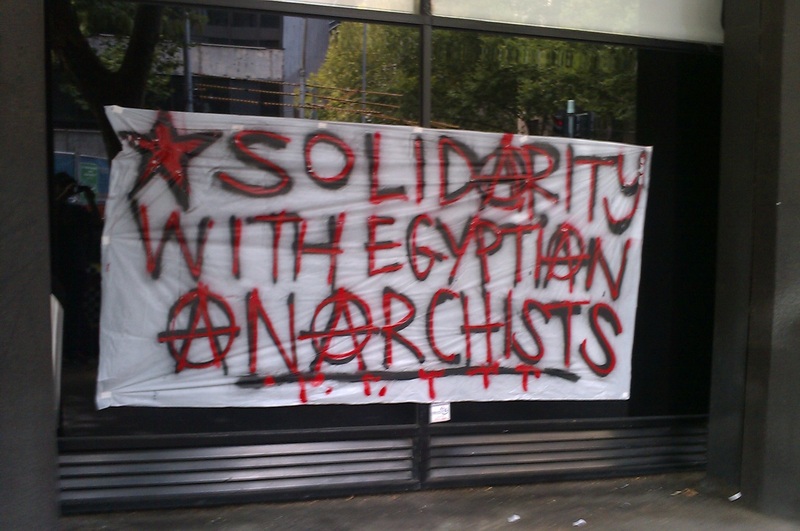 On the 6th of February in Melbourne, Australia, a small group of anarchists gathered outside the Egyptian Consulate building on Market St, CBD in response to an international call-out for solidarity actions in support of Egyptian anarchists. On the 25th of January during protests to commemorate the 2nd anniversary of the Egyptian Uprising and the protests that continued in the days that followed; Egyptian anarchists took to the streets in large numbers and for the first time formed Black Blocs in Cairo and other major cities actively confronting the security forces and physically protecting other protesters who were coming under heavy attack by security forces & plain-clothed pro-regime elements. Using rocks and molotov cocktails they bravely resisted the brutality of the security forces, inspiring not only there fellow revolutionaries but also inspiring anarchists and insurrectionists throughout the entire world. The Egyptian ‘government’ response? To declare the Black Bloc a ‘terrorist’ group and order the arrest of anybody suspected of being part of the Black Bloc. There have been 18 arrests that are known of so far. Religious extremist elements within Egypt have also been calling for Black Bloc members to be executed, stating that there are provisions in the Koran for dealing with ‘bandits’. 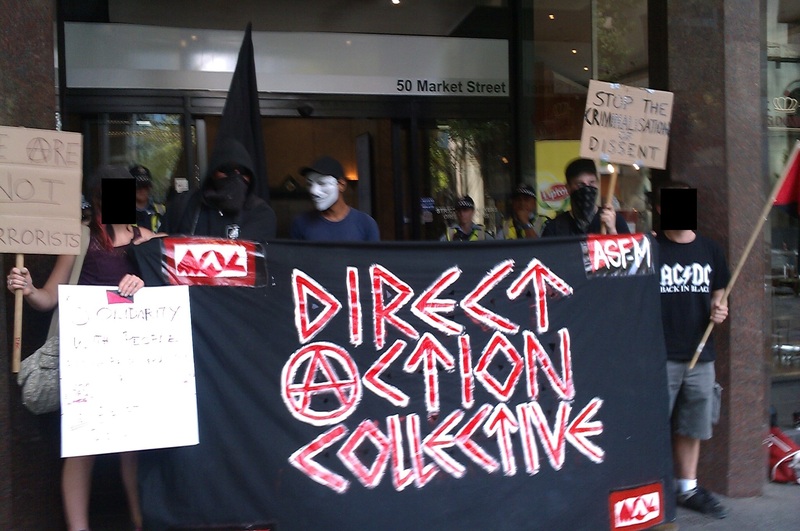 As a small act of solidarity with our anarchist comrades in Egypt, we gathered outside the Egyptian consulate with banners, black flags and music. Even though this was a small, symbolic action we still warranted the attention of both the Victorian Police as well as Australian Federal Police and Public Service Officers. There was also an undercover police element present and a clandestine police photographer was spotted in a building across the street, both being absurdly easy to spot. Again, this was a small, symbolic action, put together at very short notice…and there is always a next time! !